A sales lead is a prospective consumer of a product or service, created when an individual or business shows interest and provides contact information. Businesses gain access to sales leads through advertising, trade shows, direct mailings and other marketing efforts. OrderTime allows you to create a robust process for generating customer leads. 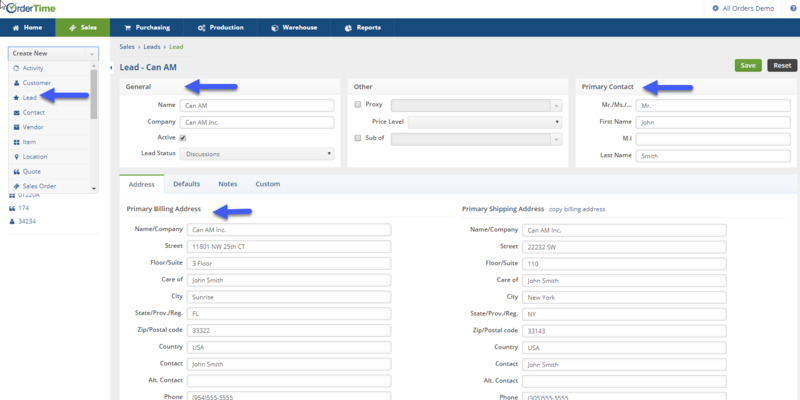 Click on the Create New drop down menu, and select Lead. Enter Customer's Name. This will be the name represented on all the customer's invoices. Select the Lead Status from the drop down menu. The Lead Status will point out the Customer's Lead progress (i.e. Discussion, Prospecting). If the customer has a proxy, check the Proxy* box and select the proxy customer. Use the drop down menu to select the Price Level. Enter Prefix (Mr. Mrs. Ms.). Type the Primary Contact First Name. Type Primary Contact Last Name. Once all the information have been entered, a lead can be turned into a Customer by simply clicking the Convert to Customer icon. When the Convert to Customer icon has been selected, a pop-up screen will ask if you wish to convert a Lead into a Customer. Click on OK, selecting to convert Lead to Customer. A customer Quote can be generated from a Lead by clicking on the +New Quote icon under the Quotes tab. The new quote screen will display with a quote number, Date, and Promise Date (Make date changes to reflect the desired Date or Promise Date.). When you are ready to create an order for a lead you must first convert the lead to a customer. You can create quotes for both leads and customer but sales orders can only be created for customers.